After years of storyboarding for Hollywood, animation assistant professor Ryan J. Woodward (BFA ’03) will tell you that people don’t generally consider animation fine art. But his experimentation with the medium culminated in a stirring piece of artwork, a short animation called Thought of You that has garnered more than 1.6 million views online and was featured in 13 film festivals. Thought of You mirrors choreography staged by BYU dance instructor Kori N. Wakamatsu (BA ’02) and performed by BYU students. 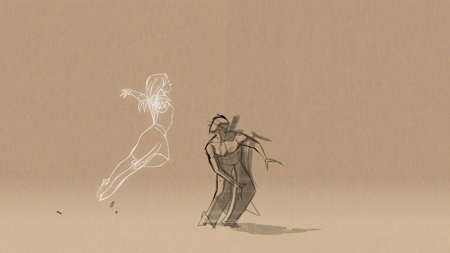 A film of the dance helped Woodward animate the dancers’ fluid movements—a feat that took more than 20,000 drawings. Many of these and other sketches by Woodward were showcased in his first gallery exhibition, Conté© Animated, Jan. 20–29 in the HFAC.